How many times have you been asked this question in the last year? Losing your phone, whether between your couch cushions or (like most Apple employees) at a bar, is a common headache. But finding your phone is another story, one that usually requires a bit of serendipity or the kindheartedness of a good Samaritan. 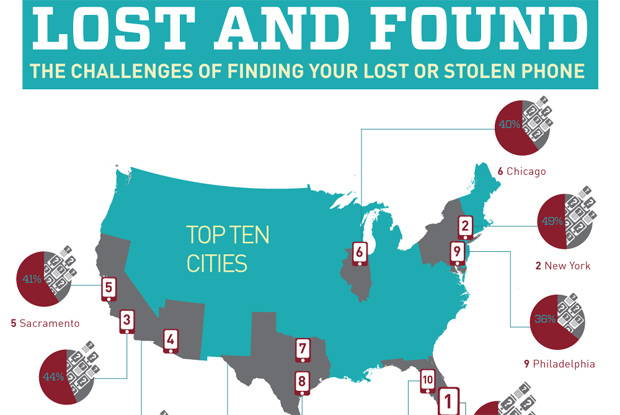 Today, mobile-security startup Lookout, which specializes in Android smartphone protection, released an infographic on the lost-phone phenomenon–namely, the 10 worst places to lose your phone, and the top U.S. cities for smartphone loss or theft. According to Lookout’s data, the No. 1 city for cellphone loss, based on the percentage of its population, is Miami. No doubt that season of the Jersey Shore factored into the outcome. (Who could’ve possibly been sober in the MIA during the weeks the MVP were present?) New York City comes in second, followed by Los Angeles, and Phoenix. Philly, Dallas, and Chicago are all in the bottom half. As for the top 10 worst places to lose your phone, based on chance of recovery, a restaurant or bar isn’t such a horrible place, coming in at No. 9 (chance of recovery is fairly high, at 80% to 95%). The car roof comes in at No. 8, with a 25% to 75% chance of recovery. Unsurprisingly, public transit makes up a big part of the top 10. Airport security, buses and subways, airplanes, taxis–all these areas are prime spots to lose your phone. The worst location to have your phone go missing is the swimming pool, which has a 50% to 75% chance of recovery–but your sopping-wet phone, even if retrieved, has less than a 5% chance of ever working again.